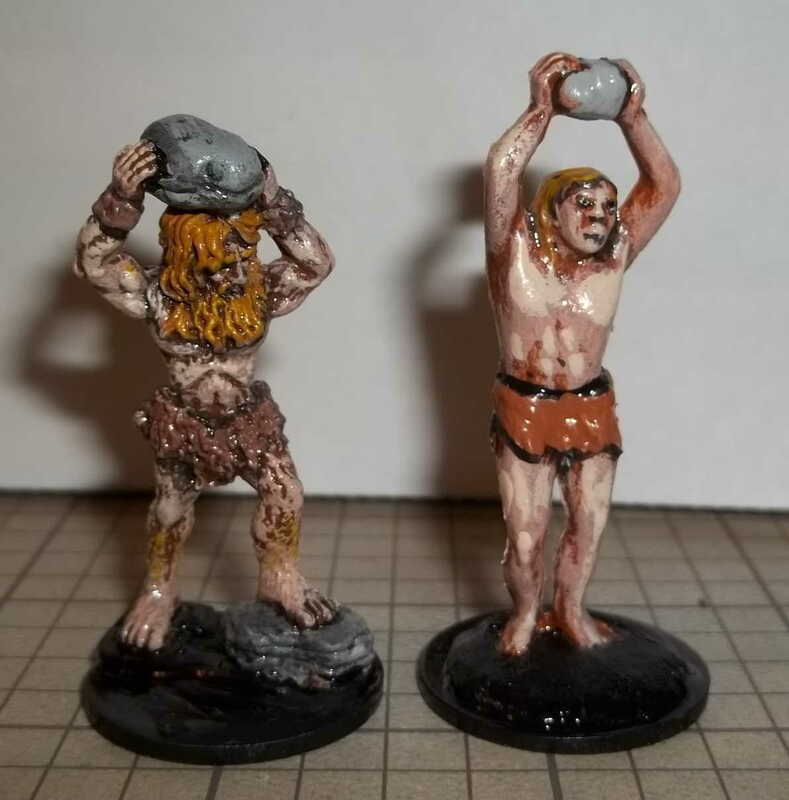 Back in the early 1970s when Gygax and his buddies were improvising fantasy miniatures for their wargames and proto-D&D, plastic caveman figures stood in for ogres. Various toy companies had sets of prehistoric animals like saber-tooth tigers and mammoths that came with a handful of cavemen figures (to be their hunters, or prey, I guess). I remember my brother & I having a few cavemen that came in a set with dinosaurs and prehistoric mammals when we were kids, so it was a kick to find, among the DFC minis and knock-offs, several knock-offs of (I believe) the old Marx cavemen figures — including several I recognized from my childhood. They are pretty similar in height the TOYCO “barbarians” or “giants” or whatever they are (like some of the other TOYCO figures, they are not really knock-offs of the DFC line at all). So I thought they should all get a similar paint job to form a small clan. None appeared to be female, although the stout one with a spear might be a child. In fact I may use more for juvenile giants than as ogres, since ogres in D&D have been getting steadily larger and broader. Really with scale creep these guys are only 7-9 feet tall at the most, compared to other figures. Interestingly they are almost exactly the size of the Grenadier AD&D hill giants that came in a blister pack. I have an extra rock-lobber from that set so I painted him in the same group too. I’ll probably re-base the ones on square grassy bases like the newer guy. The Marx knock-offs were made in a waxy plastic of various colors — including orange, silver, and black — which reminds me off some plastic figures made in former Soviet republics that flooded the 1/72 scale market a few years back. A few had bases but some did not, so I had to plant them in epoxy putty to get them to stand. All are on bases about an inch across. Larger sized bases, like the ones most of my giants and ogres are on, seemed too big. Anyway, when my thoughts turned to what they’d be in AD&D terms, I looked through the monster manuals and noticed a relative dearth of 8 foot cavemen. The closest thing seemed to be Verbeegs, though by second edition they approach 10 feet tall. However they are barbaric and described as “unusually thin” for their height. 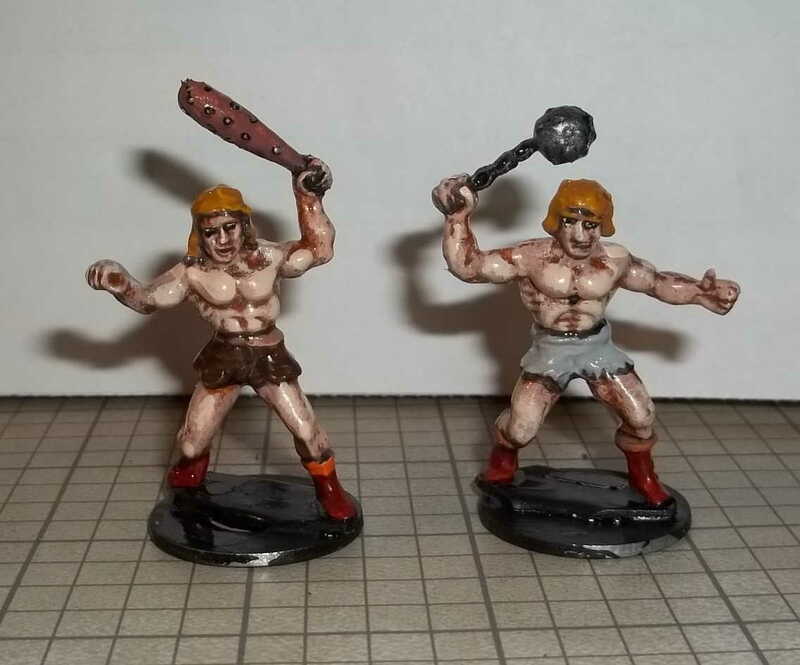 The cavemen certainly are thin compared to regular D&D minis, since these guys use human proportions rather than the cartoony proportions that most D&D and fantasy figures have. 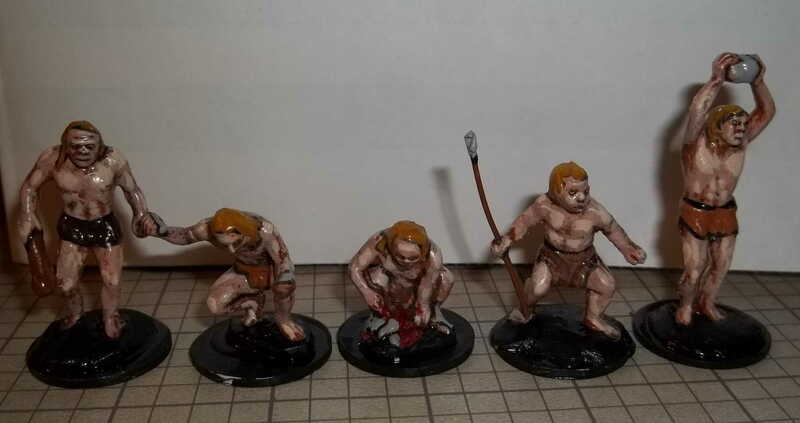 (Even Tom Meier’s sculpts for Ral Partha, which are unusually realistic, have noticeably over-sized hands and heads; most other sculptors have totally given up on realism in favor of the convention that features be exaggerated to make up for the small scale.) The illustrations for Verbeegs are barrel-chested, though some descriptions of Vergbeegs in later editions of D&D modify the descriptions to either downplay their thinness or explain the look by saying they wear multiple layers of furs and clothes, perhaps to hide their slimness. Troggs are large cave dwellers, perhaps distantly related to humans. Their material culture is very primitive, and they wear only furs and skins. Some wear decorations like animal teeth or other trophies strung on sinew. They make crude weapons, such as clubs, axes, and spears. These generally do d6 damage, plus 4 for their great strength. Alternatively they throw rocks for d10 damage at a range of up to 120 feet. They live in clans of 2d6 members; d8x10% will be juveniles (2 HD). The womenfolk usually are armed with flint knives which cause d4 damage, plus 4 for their great strength. Each clan has a leader with 7 HD and who saves as 7th level fighter. One clan in four will have a shaman who casts spells as 5th level druid and saves as 5th level cleric. One clan in six will also have a champion who has maximum HP and fights and saves as a 7th level fighter. They are not necessarily man-eaters but tend to be surly and easily provoked to fight or flight. They fear elves and will attempt to flee from them, but if forced to fight will focus their attacks on them if there are non-elves also fighting. They hate ogres and attack them on sight. Their treasure is usually negligible but some clans will have a magic item or book that they consider a sacred talisman (50& chance of each). They will not willing part with such a talisman unless offered something spectacular (to their primitive minds) in trade.